I recited this last night for the first time ever from 2:30am til 5:15am, approximately. I recited aloud to my cats and imagined the words were coming from Buddha himself and that I was also reciting for countless invisible beings in the various world realms. I tried this before with either this sutra or the Golden Light Sutra and got frustrated and stopped. Though it became difficult around page 30, as I was reading slow and coherently rather than just trying to read it as fast as possible, I am really glad I did not give up, even though I obviously ended up going to bed quite late. I can't quite explain how I felt afterward and even still feel today, but I feel good. The experience has caused me to want to read more sutras even now as I am procrastinating and considering what to do with myself. I kind of want to turn on Hulu or Netflix and lay around lazily with some coffee and watch something mindless... but I feel like I would be distracted by the sutras I have which I could read. Do the Mahayana sutras tend to have this effect? It is strange because they are repetitive and can be a little frustrating if you are trying to recite them, but then there is a feeling of general well-being and clarity afterward, at least in my experience with attempting to read a few Mahayana sutras. Avatamsaka translation by Thomas Cleary was not possible for me to finish even reading silently at this point in my life. My mind could not take it, but I do remember feeling "good" after the attempt. padma norbu wrote: Do the Mahayana sutras tend to have this effect? It is strange because they are repetitive and can be a little frustrating if you are trying to recite them, but then there is a feeling of general well-being and clarity afterward, at least in my experience with attempting to read a few Mahayana sutras. Avatamsaka translation by Thomas Cleary was not possible for me to finish even reading silently at this point in my life. My mind could not take it, but I do remember feeling "good" after the attempt. Yes--for me they do at least. I'm always energized by reciting sutra. The more you get to know a particular one, the more you find new things in it (and it helps to copy them out by hand as well). If you can chant it rhythmically, so much the better. I've recited the Sanghata Sutra eleven times and I never once get bored of it. You're right when you say that the language of the translation makes all the difference. The BDK translation of the Lotus Sutra, for instance, is very chantable. thanks, Jikan, I just put it on my wishlist! Me too...I love to read Suttas and love to chant a few gathas...I feel so peaceful when chanting. i think you ca get this sutra from FPMT store, and with only a small donation. ive read it once, its a nice sutra though but i didnt understand the how are sentient beings classified as ''young sentient beings '' and '' old sentient beings ''. it gives you a nice visualization of a buddha purifying a complete realm but your like , pleeh , like that would happen here on this planet on this day and age. its a precious gem though, very nice to be able to read it, its worth the go, maybe someday again, it describes the benefit to be massive, immeasurable basically if animal hears you recite the sutra, even one gatha. but the first and only time i have read it i was waiting and waiting for the actual teaching of the sutra to start, and then it ended, describing only the benefits of reading the sutra. which left me a bit baffled. KonchokZoepa wrote: i think you ca get this sutra from FPMT store, and with only a small donation. ive read it once, its a nice sutra though but i didnt understand the how are sentient beings classified as ''young sentient beings '' and '' old sentient beings ''. it gives you a nice visualization of a buddha purifying a complete realm but your like , pleeh , like that would happen here on this planet on this day and age. its a precious gem though, very nice to be able to read it, its worth the go, maybe someday again, it describes the benefit to be massive, immeasurable basically if animal hears you recite the sutra, even one gatha. but the first and only time i have read it i was waiting and waiting for the actual teaching of the sutra to start, and then it ended, describing only the benefits of reading the sutra. which left me a bit baffled. I get the feeling a lot of these visuals are not happening in our regular karmic vision. I thought the young/old sentient beings thing was pretty interesting. Currently reading the Sutra of Golden Light out loud. I wasn't able to finish it in one sitting, but within 2 days I'll be done. They are very interesting, they fill in a lot of blanks about god realms for me. I'll be reading and listening....seems they have this all for free and for the world here. Minobu wrote: I'll be reading and listening....seems they have this all for free and for the world here. That's good. The Sanghata Sutra is excellent. i have the file and the link to listen to a woman give it..
so i will be listening and reading...i have to take my time though so i can not lose concentration. I'm approaching it like a Healing Medicine direct from the Buddha. I believe it is a grave transgression to slander the Dharma, and as this text is Dharma, I can only bow to it with revence and respect. Nevertheless, from my limited viewpoint here in Samsara as a defiled being, I must admit there is much about this sutra that puzzles me. I seem to have failed to receive the effects many others have ecstatically lauded. For me, the Sutra seemed an extrmemly self-referetial (i.e., self laudatory) and repetetive text. Of course, many sutras share both qualites, but none I have come across exhibits this trait to quite the extent of this one. For example, the translation I have seemes to do almost nothing but praise the act of reading the sutra itself, and repeat again and again that the merit from reading or memorizing a four-line stanza is incomparably greater than giving the most precious gifts to exaulted beings filling various types in vast realms as numerous as the sands in [pick a large number] of Ganges rivers. This is a familiar device from many Mahayana Sutras, of course, but never have I seen it employed so frequently as in this Sutra. Far be it from me to contradict the truth of a Sutra, but after several dozen repetitions of this, well...one might start to wonder exactly whether this Sutra has any teachings on other topics, in addition to the teaching of its own value. The Diamond Sutra and the Lotus sutra, to pick two off the top of my head, if I'm not mistaken, are also self-referential in parts, but this is not the only feature that defines their content. Perhaps I am reading it in an incorrect way...being too linear or hermaneutical about it? Perhaps it should be read or chanted for its effects rather than puzzled over for its meaning as one might approach, say, a high-analtical Yogacara text. Maybe I'm just coming to it with an incorrect attitude? Any advice, feeedback, etc. appreciated. This sutra's purpose (or one of its purposes) is to give persons who have faith in it a means to accumulate merit. The sutra says that if you offer prostrations, flowers, and the like to it, then you accumulate great merit. If that's the case, then, what course of action is most sensible? You can try analyzing it for meaning and be frustrated, or you can recite it and offer prostrations, flowers, and the like and be happy after dedicating the merits to the liberation of all beings. That seems like an easy choice to me. I understand your doubt about it being "self-referential". I read people trying to sieve out its central idea but failed. 1. 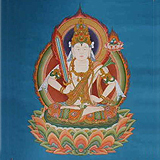 It is classified as a Mahayana sutra but there is no obvious Mahayana's idea in the sutra. 2. there are claims about huge number of its ancient hand scripts discovered in Dun Huang's cave but critical people are not satisfied that they did not even see a photo archive of these discovery. 3. There are claim of it being highly revered at the ancient Nalanda monastic university but Xuan Zhuang who was there around the time this sutra was translated did not translated this sutra. 4. There is no record in history any reputable masters giving a discourse on this sutra except the most recent FPMT.